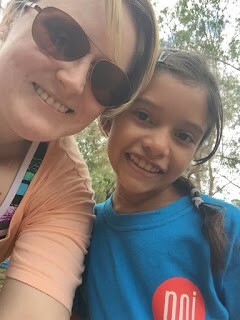 I got the opportunity to go to Tegucigalpa, Honduras, this summer and help with what POI is doing there; but let’s be honest, the real reason I went was to be able to meet this precious little girl who has won my heart even though I have never heard her voice or touched her little hands. 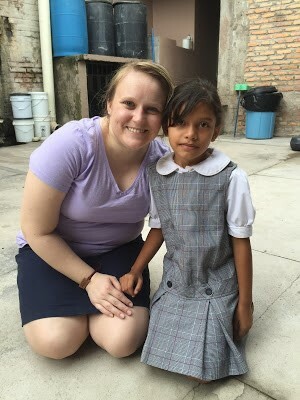 I began sponsoring little Keisi in March of 2014. She was 6 years old then, and the only reason I chose her was because she and I had the same name. I didn’t know what a precious soul she was and kind heart she had. I have enjoyed loving on her from a distance, but meeting her in person was one of the greatest blessings I have ever received. Keisi is very shy. In fact, several months ago, POI did video interviews with the children and sent them to their sponsors. Keisi was too timid to even talk to the camera; she just gave me a little wave, so I was kind of nervous about how she would respond to meeting me. The first full day we were in Tegucigalpa, I was assigned to do recreation for VBS in Keisi’s neighborhood. (The person who made assignments had no idea my sponsored child was in that neighborhood; it was totally a God thing.) Early in the morning, Mrs. Ruth found her and brought her to meet me. As you can see, she was very reserved at first. 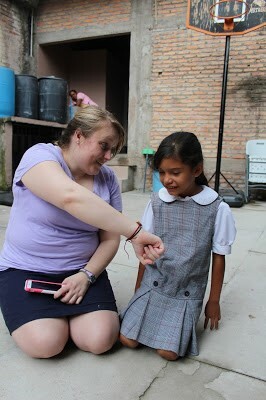 Then I introduced myself in Spanish that was probably full of mistakes, but she seemed to forgive each and every one of them, and I showed her that I was wearing a braceleshe had made for me and written her name on with the help of one of the groups who took a trip to Tegucigalpa over spring break. Seeing me wearing the bracelet she had made for me made he little face light up and she decided she could talk to me a little. She said she had a photo of me, so I told her that I had photos of her too, and I showed her that the background of my phone was her picture. Upon seeing her picture on my phone, first she smiled this huge smile and then, this timid little girl reached over, unprompted, and gave me the biggest, most heart-melting hug I have ever received. I truly can’t imagine a more meaningful hug. I could have melted into a puddle right then and there. Keisi went home that day and told her mother that I was at the POI center, so the next day her mother came to meet me, and she thanked me for all I’m doing for her little girl. She said that Keisi takes very good care of all the gifts I have sent her (In fact, the sandals Keisi wore all week were some I had sent her with a spring break group.) and that she talks about me even though she had never met me. Keisi’s mother also let me know (when I asked if they had any specific needs) that she and her 5 young children are sleeping on the floor. Praise God that through POI, I am able to help meet that need and little Keisi will no longer have to spend her nights sleeping on a concrete floor. So now I have not only made a connection with this 7-year-old girl but with her mother as well. That was truly a humbling experience. My eyes brim with tears as I think of the impact that this tiny girl has made on my life when it was I who set out to make an impact on hers. By the last day we spent together, she came and found me, grabbed my hand, and said, “Vamos!” (Come on!) as if we had been best friends for years. I now keep the following photo as the background on my phone. It’s from that last day, and Keisi’s countenance is so different from the moment we first met. We are friends now; we are family. I am her madrina (godmother), and she is my ahijada (goddaughter). This face is the face of a child who feels loved. 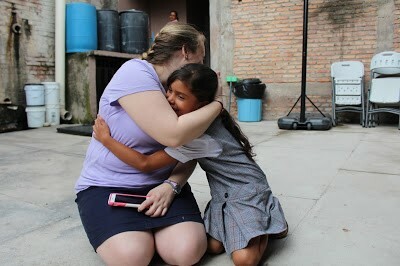 I hope and pray that the Lord gives me the opportunity to wrap my arms around this baby girl again and again and again. Thank you, POI, for giving me this amazing opportunity. It was a cool, rainy morning when we arrived at the POI neighborhood commonly known as “Feb 21.” The mission teams always wonder why it’s called this—until we explain that it was the day the neighborhood was founded. On the agenda for the day was the delivery of four new mattresses to some families the staff pre-selected for us to visit.